The South African drug regulatory system is conceptualised in the National Drug Policy (NDP), published in 1996. The National Department of Health (NDoH) aimed to address previous structured inequalities and inaccessibility to medicines with the implementation of the NDP, hoping to ensure '... adequate and reliable supply of safe, cost-effective drugs of acceptable quality to all citizens of South Africa and the rational use of drugs by prescribers, dispensers and consumers'.1 The NDP outlines specific health, economic and national development objectives, including the availability and accessibility of essential medicines, the safety and quality of medicines, good dispensing and prescribing practices, and individual responsibility for health and informed decision-making. Other policies have also expressed economic goals such as promoting cost-effective use of medicines and establishing advisory groups for pharmaco-economics. The Medicines and Related Substances Control Act 101 of 1965 (as amended) makes provision for the registration and control of medicines, as well as the licensing of professionals to dispense and manufacture them.2 Those permitted to prescribe and dispense medicines are registered by their Professional Councils as enacted by the Pharmacy Act 53 of 1974, the Health Professions Act 56 of 1974, the Veterinary and Para-Veterinary Professions Act 19 of 1982, the Allied Health Professions Act 63 of 1982 and the Nursing Act 33 of 2005. Until an independent quality control laboratory is established, universities conduct quality control testing under contract with the MCC. The NDoH has in the past outsourced, on tender, the quality assurance role of the MCC and two institutions were awarded tenders. The Centre for Quality Assurance of Medicines (CENQAM), located on the Potchefstroom campus of North West University, was contracted to perform post-marketing quality control surveillance on pharmaceuticals, while the National Control Laboratory (NCL) at the University of the Free State undertook quality control testing for the batch release of biological medicines and vaccines.6 The last CENQAM contract ended in 1999, and the MCC has since made use of CENQAM services on an ad hoc basis, submitting only samples suspected of being sub-standard for testing. Counterfeiting of pharmaceuticals in South Africa is highly problematic, with an estimated one in five medicines sold believed to be counterfeit.7 The majority of counterfeit medicines are imported from India and Pakistan and reach pharmacies through illegal means. The NDoH has a small team investigating the issue, but there had only been one successful prosecution as at 2010. Programmatic pharmacovigilance and awareness of pharmacovigilance in South Africa was boosted when the Operational Plan for Comprehensive HIV/AIDS Care was launched by Parliament in 2003 with the responsibility of implementation delegated to the MCC. The pharmacovigilance programme has experienced a high staff turnover and systems problems, and, although the MCC secretariat is responsible for ensuring the proper functioning of the key units, there is no formal relationship between the MCC and the University of Limpopo/Medunsa unit, or any system of peer review of the unit.10 As a result, many provinces have developed their own pharmacovigilance programmes and non-governmental organisations such as the President's Emergency Plan for AIDS Relief, Management Sciences for Health and Wits Health Consortium have also developed pharmacovigilance programmes that do not feed into the national system (personal communication by Dr Ushma Mehta). Antibiotic management encompasses restrictions on the use of antibiotics by type and application, especially those to which resistance emerges rapidly.11 Limiting the choice of antibiotics through the use of formularies may not only reduce hospital flora to a wide spectrum of antibiotics, but can save costs to the patient, the facility and the government. The development of Essential Drugs Lists (EDLs) and Standard Treatment Guidelines (STGs) forms part of this strategy in the public sector. In the private sector, formularies are developed at the discretion of the facility management and, reportedly, there is little enforcement of their use in practice. The pharmaceutical industry in South Africa is relatively well developed and mostly focused on the production of generics, including manufacturing copy medicines under licence.7 Several multinational companies have a presence through local subsidiaries and increasingly view the country as a stable base from which to penetrate sub-Saharan Africa. The public sector tendering process is highly competitive and provides huge opportunities to bid winners. The market is currently fragmented, with no one player holding more than 15% market share. Domestic producers meet around one-third of the country's pharmaceutical demand, with the percentage higher in the generics sector. Key foreign companies are GSK, Sanofi-Aventis, BMS and Johnson & Johnson. US companies supply over one-fifth of the market, followed by German, British and Swiss firms. In June 2010, South Africa's Minister of Trade and Industry welcomed Indian pharmaceutical companies to establish manufacturing units in the country. The invitation came as part of the government's larger industrial policy framework. The government maintains a cost-conscious medicine procurement policy, which is biased towards local industry and generics. The process begins with the submission of orders and expected pharmaceutical needs from hospital PTCs to the NDoH, which manages a competitive tender process among suppliers. Once a tender is awarded and fulfilled, medicines are distributed through government warehouse depots housed in each province. Primary health clinics generally order from large hospitals in their areas or from the supply depots. The majority work on an EDL and have a set protocol of antibiotics they can use for treating specific conditions. Their demand is included in the quantities the government calls for in the tender. Although varied, and presumably increasing, hospital demand should form the basis of the tender amounts. A review of tenders over the past 4 years (2007 - 2011) shows little to no change in the quantity of antibiotics requested. The reason for this is unclear. The private sector functions differently. Three large hospital networks constitute the bulk of demand, viz. Netcare, Medi-Clinic and Life Healthcare. Each network reportedly has a formulary on which they base the types of antibiotics to order. Because private hospitals are not restricted to following formularies in the manner that public hospitals are bound to the EDL, the formulary is not necessarily followed by facilities in the pattern of antibiotics stocked. Private sector facilities can purchase medicines directly from wholesalers and pharmaceutical companies, all of which must be approved by the MCC. Three distribution companies - IHD, Kinesis and PHD - distribute the majority of originator medicines on the market (IMS background paper). These distributors handle stocking on behalf of their principals and undertake delivery to wholesalers, pharmacists, dispensing doctors, private hospitals and other private outlets. The NDP aim of developing 'human resources to promote the concepts of rational drug use' is enabled by pharmaceutical support staff appointed to ensure an optimal distribution chain. Multidisciplinary hospital PTCs are recommended in the public and private sector to ensure efficient and cost-effective medicine supply and use by compilation of a hospital formulary and good supply chain management.1 By law, only licensed practitioners may prescribe and/or dispense antibiotics. A prescription or verbal instructions of an authorised prescriber known to the managing pharmacist are necessary to purchase antibiotics from a hospital or private pharmacy, and unregulated over-the-counter sales are not the major concern of national antibiotic stewardship. The Health Professions Council of South Africa and the Allied Health Professions Council of South Africa register medical practitioners to prescribe, compound, dispense and possess medicines.2 Professional Council regulations make explicit mention of the conflict between being licensed to prescribe medicines and pharmacy ownership or management. Whereas other countries allow prescribers to both practise medicine and own pharmacies, South Africa prohibits it and may thus reduce associated abuses. It is not known whether the restriction has an impact on the financial incentives of prescribers or the amount and types of antibiotics they prescribe. Pharmaceutical pricing and reimbursement is a contentious issue in South Africa.7 In the past prices were virtually uncontrolled, with the government, manufacturers, wholesalers and retailers all denying responsibility for the resulting high costs to patients. Reform through the Regulation on the Pricing of Medicines and Related Substances legislation in 2002 sought to address the problem, but implementation proved difficult. Further, controversy surrounded the 'single exit price', a flat fee system for dispensers, which replaced the mark-up system. Under the law, dispensing fees for prescription drugs were set at a maximum 26% of the manufacturer's selling price. After repeated disputes, the government revealed a new pharmacy dispensing fee system in which there are a series of mark-up percentage ceilings within medicine price brackets. Under the new structure, pharmacies charge less for low-priced, high-volume medicines like antibiotics, but can increase their fees for higher-priced products. Although it is hoped that this progressive system will increase access among low-income patients, this may be at the expense of independent, small pharmacies that are unable to sustain falling profit margins. At present, government tender documents are the only source of information on antibiotic spending and demand in the public sector. However, the information has yet to be evaluated or assessed and is therefore not available for this report. Medicines remain a key contributor to rising health care costs.14 However, encouraging growth in the use of generic medicines could result in significant cost savings. Originators still account for 59% of the pharmaceutical market in terms of value sales, but generic medicines dominate the market in terms of sales volume.7 By 2014, the pharmaceutical industry predicts that the generics market will have grown by 13.3% in local currency terms. Generic efficiency, or the number of times a generic could be dispensed, also increased from 69% in 2007 to 72% in 2009.14 The reasons for this growth include but are not limited to more generic alternatives being made available on the market, and their encouraged use by medical schemes and the government. Information on antibiotic consumption in the private sector comes primarily from IMS Health. Data are collected from wholesalers as well as from direct sales from manufacturers to pharmacies. From a value perspective, the top three classes of antibiotics used in the private sector are oral broad-spectrum penicillin with 18.3% of the market, penems and carbapenems with 14% of the market, and macrolides with 11.1% of the market. 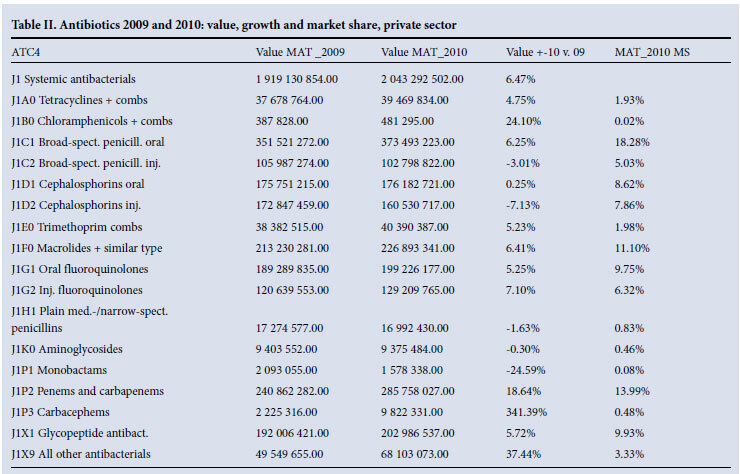 While penicillins and macrolides both exhibited growth rates over 6% from 2009, use of penems and carbapenems grew by 18.6%.15 The value, growth and market share for antibiotic classes are shown in Table II. 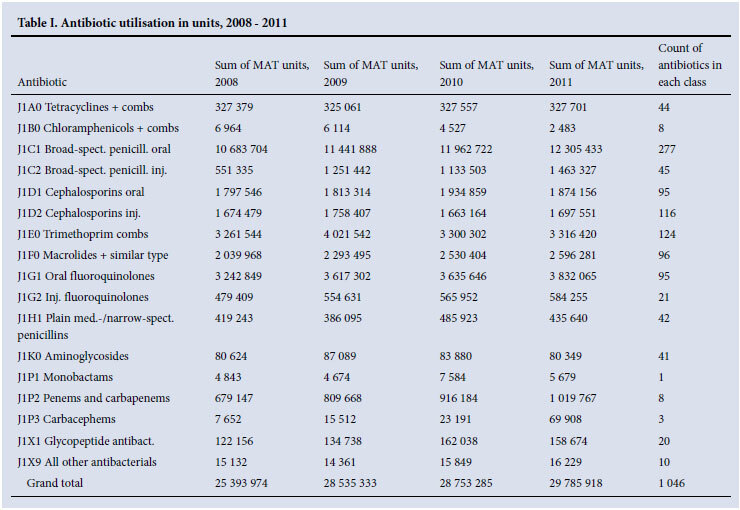 The top 20 antibiotics contribute 61% towards the total systemic antibacterial market. Targocid is ranked first with a 9.2% market share and growth rate of 8.3% from the previous year. 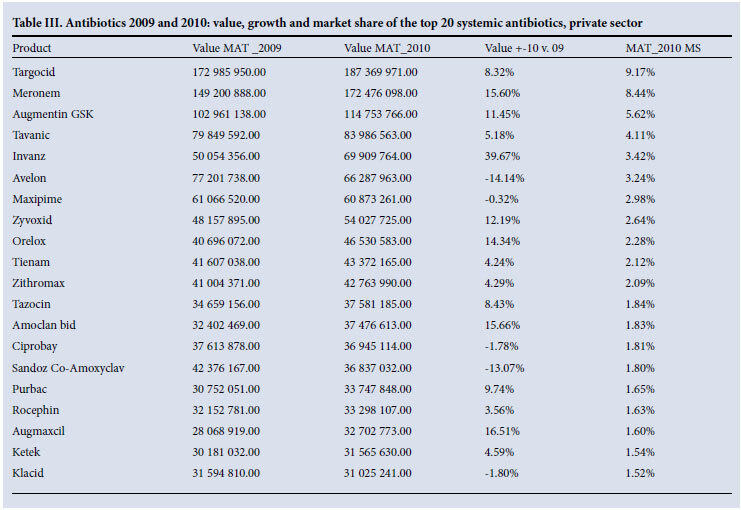 Meropenem, ranked second, has a market share of 8.4% and growth of 15.6%, and Augmentin GSK is ranked third with 5.6% of market share and growth of 11.5%.15 The value, growth and market share of the top 20 antibiotic agents are shown in Table III.